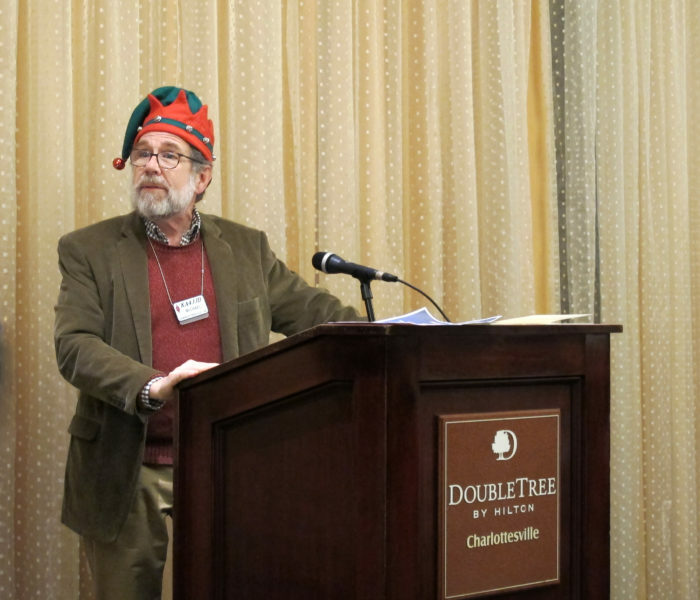 The following report was prepared by the Awards Committee Chair, Michael Rein, KA4JJD. 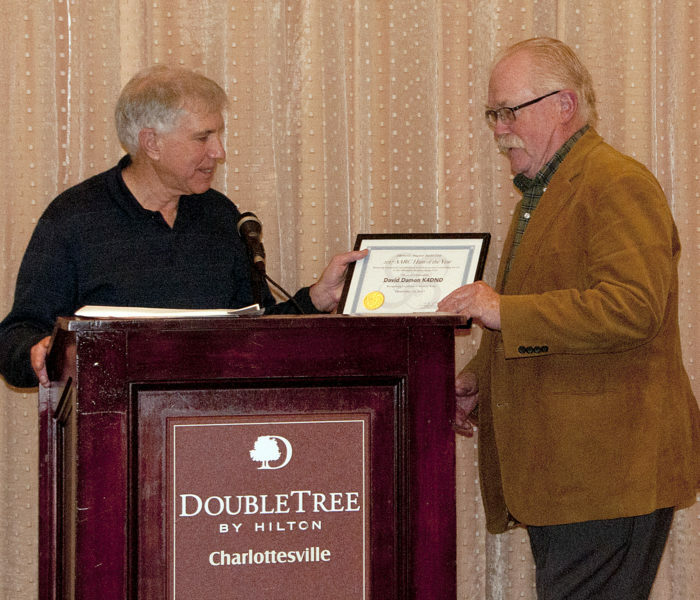 The annual awards dinner of the Albemarle Amateur Radio Club was held on December 12, at the DoubleTree Hotel. The meeting was attended by 47 members and guests. President Ed Berkowitz N3US called the meeting to order shortly after six in the evening and called for introductions of members and guests. 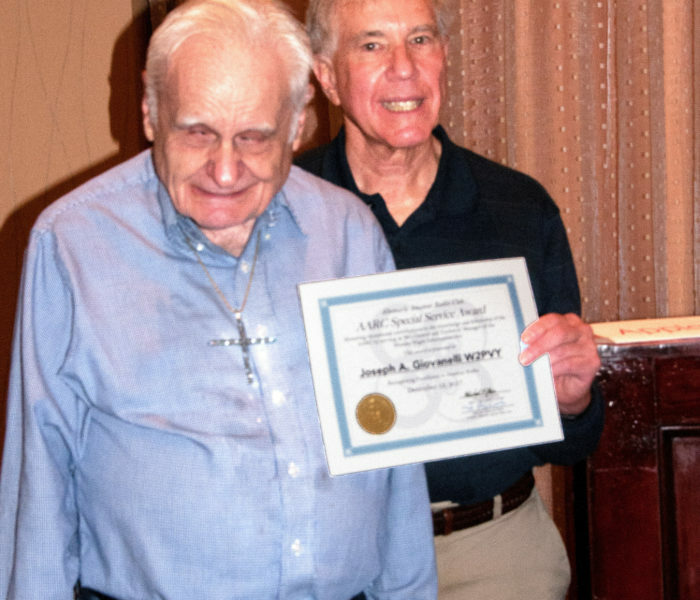 Larry K4JZQ, AARC Vice-President, presented Ed with a certificate of appreciation for his three years of service as President, citing his outstanding guidance and innovation. Ed received a standing ovation from the Club. An excellent buffet dinner was then consumed. 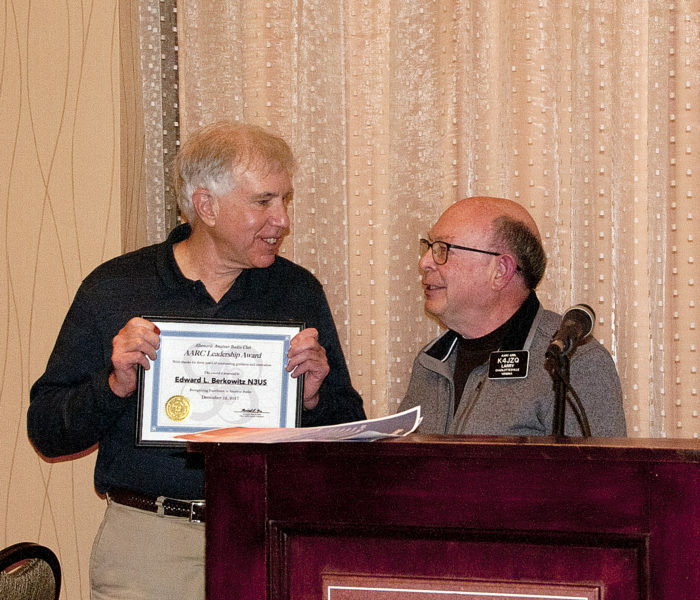 Michael KA4JJD, Chair of the Awards Committee, thanked its members: Dave K4DND, Bill AD6JV, Bob K4DU, Ed N3US, and Larry K4JZQ. Ed N3US presented a Certificate of Welcome to Maribel Street, newly appointed Emergency Management Coordinator for Charlottesville, UVA, and Albemarle Co. He presented Certificates of Appreciation to: Marjorie L. Sidebottom for steadfast support of Amateur radio and the AARC and with congratulations on her new position; James J. Condon for arranging for our ability to continue meeting at the National Radio Astronomy Observatory; Alison Farole for continuing support of amateur radio and the AARC by permitting use of the ACC during several public service events; Kirby Felts for providing an outstanding site for our 2017 Field Day exercises; Steven Geiger for arranging for our ability to continue meeting at the National Radio Astronomy Observatory; and Thomas Hanson for providing an outstanding site for our 2017 Field Day exercises. Michael KA4JJD presented this year’s Club’s operating awards. As usual, there were none. He explained that these awards were aimed at encouraging less-experienced hams to expand their operating repertoires. Epic fail. Ed N3US presented the AARC’s Special Service Awards for going above and beyond standard duties. For assisting amateurs by serving on the Antenna Committee: Ed N3US; Al KF4AGT; Larry K4JZQ; Jim K4CGY; Bob K4DU; and John KK4JP, who received a special endorsement for using a drone. 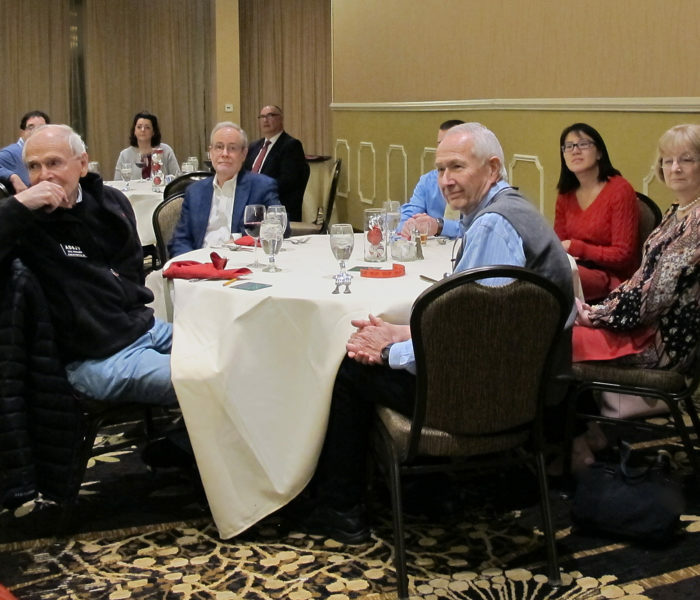 Ed N3US presented Special Service Awards to members of the Estate Committee for assisting families and the AARC: Ed N3US, Jim K4CGY, and Bob K4DU. Additional Special Service Awards included: Joe W2PVY honoring exceptional contributions to the knowledge and fellowship of the AARC by serving as net control and technical manager of the Monday Night Information Net; Rick W3KDR honoring contributions to the AARC in providing outreach to young people by co-chairing Club activities at the Virginia Regional Science Fair; Bill AD6JV honoring contributions to the AARC in providing outreach to young people by co-chairing Club activities at the Virginia Regional Science Fair; Bill N0WP honoring exceptional contributions to the Technical Committee of the AARC through outstanding dedication to and excellence in repeater maintenance; Ron K4RKA honoring exceptional contributions to the history of the AARC by compiling and maintaining a listing of our Silent Keys; Jim K4BAV for stepping in and ably fulfilling the position of Secretary. Larry K4JZQ present awards for outstanding talks at Club meetings to Travis W3TJK and Mike KQ9P. Dave K4DND, Director for Public Service, explained the role of Public Service and its value to the community. He presented awards for those participating in public service events to: Ed N3US, Larry K4JZQ, Mike KN4BFB, Greg N4PGS, Rich KI4QKV, Dayton AA4DH, Jeff K4OLW, John KK4JP, Dan KD2GTF, Bill (no call), Mike KQ9P, John JE7HX, Jim K4CGY, Patrice KM4RSL, Bill N0WP, Steve W4SVP, Michael KA4JJD, Elmer KF4UCI, Jon KJ4RPW, Rick KJ4ZIH, Margaret (no call), Bill K4OOO, Shannon KJ4VJR, Rick N4EFP, Leonard N4LXP, Andrew KK4SHO, and Bubba WW4GW. Dave K4DND then presented to Greg N4PGS the Hein Hvatum N4FWA Award for outstanding public service. This award, one of the most important presented by the AARC, memorializes its namesake, who was a good friend and example to many in the AARC and was instrumental in designing and promoting public service activities. Outreach Awards for participation in the Boy Scouts Apple Harvest were presented by Dennis WR4I to Larry K4JZQ and Jim K4CGY. Dennis, who again organized the event also displayed a certificate of appreciation that had been presented by the scouts to him and to the Club. Outreach Awards for participation in the Barnes and Noble Maker Faire were presented by Rick W3KDR, Director for Education, who organized the event to: Larry K4JZQ, Jim W4BAV, Ron K4RKA, Michael KA4JJD, John KK4JP, Bill AD6JV, Patrice KM4RSL, Mike KQ9P, Rich KI4QKV, Dave K4DND, and Ed N3US. Rick also presented the Wordsmith Extra Class Award to Michael KA4JJD. 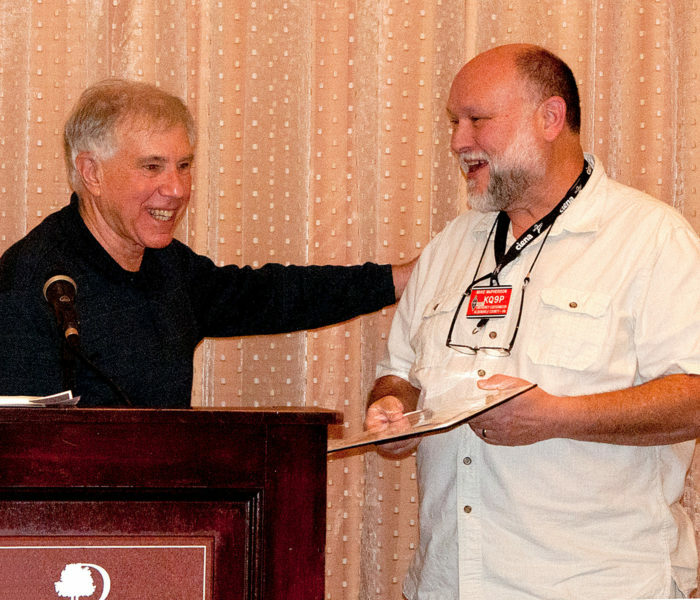 Bob K4DU presented awards recognizing contributions to the AARC Field Day exercise, which he directed. Get On the Air (GOTA) Awards were presented to coaches Bill AD6JV, Marty W4MBW, and Michael KA4JJD; and to John KK4JP (GOTA equipment). Awards were presented to bonus-winning GOTA operators Vicky (no call) and Steve KN4CJI. Prodigious operating was recognized for Dennis WR4I (top operator), Bob AK4BR (second top operator), and Paul AK4OH (third top operator, providing publicity). Awards for participation were presented to Rich KI4QKV, Mark AK4OL, Alan K9MBQ, Al KF4AGT (Have spud-gun, will travel, special endorsement for not hitting anyone), Dennis WR4I (CW operations and hex-beam assembly), Ed N3US, Patrice KM4RSL (participation and psychological support), Jim K4BAV (once again attracting onlookers through costume and key), Travis W3TJK (for meteorological support), AJ KE4AJM (network and software support), Larry K4JZQ (major support of many aspects), Bob AK4BR (the Late Late Show), and Mike KJ4MFN (tables and chairs). Michael KA4JJD presented the Elmering Award to Mike KQ9P for his education, nurturing, and motivation of the W4UVA Radio Club. Michael KA4JJD then presented some special awards which “did not fit into other categories: The Slow Newsday Award to Jim K4JEC for assiduously publishing the doings of the AARC in Crozet Today; The Can You Hear Me Now Award to Bob AK4BR for his continuing stentorian enthusiasm; The Never Give Up Award to Bill N0WP for assiduously and repeatedly fixing all the repeaters; The XYL of the Year Award to Connie Pond (no call) for putting up with Bill while he never gives up; The Loyal Sidekick Award to Jeff K4OLW and to Dave K4DND for riding over hill and dale and continuing to do all that repeater stuff with Pond; The Associate Repeater Caretaker Award to K4OLW’s four-wheel drive for repeated hauling AARC members to isolated repeater sites; The Spider Man Erection Award to Bob K4DU for handling the setting up of the hex beam for Field Day; The Magnificent Seven Award to Bob K4DU for leading the FD team to a seventh place national ranking in the 3F category; The Witness Protection Award to Larry K4JZQ for his pursuit of stealth operating; The Round ‘em Up Award to Larry K4JZQ for scurrying around B&N and sending people to the AARC Maker Faire table; The Triumph of Hope Over Experience Award to Michael KA4JJD for requesting a Field Day proclamation from the Charlottesville City council and receiving one after having been turned down the previous two years; The Triumph of Hope Over Experience Award to Pat (no call) for resolutely operating the GOTA station but making no contacts; The Associate Herding Cats Award to Larry K4JZQ for actively serving at FD 2017 as the immediate past Director of FD; The Not a Coward Award to Rick W3KDR for organizing the 2018 Technician License Class; and The Not a Coward Award to Bob K4DU for serving as Chair of the (shudder) 2017 AARC Nominating Committee. The final raffle of the year was conducted by AJ KE4AJM, Director for Fundraising, with special prizes including HTs (which AJ had programmed for local repeaters and other handy frequencies), a mobile rig, a sort of a CB/weather rig, and an ARRL Handbook. A tidy profit was obtained. Ed N3US presented the final awards of the evening. The President’s Award, honoring exceptional contributions and value to the President of the AARC, was presented to Mike KQ9P. The Ham of the Year Award, honoring exceptional and sustained contributions and outstanding service to the AARC was presented to Dave K4DND. Thunderous applause ensued. Ed N3US adjourned the formal portion of the meeting. In keeping with the wonderful camaraderie of the AARC many people stayed around to visit and to eat more desserts. Neither was unexpected.